There must be an equal number of points in [CalibA] [CalibB] and [WorldPts] with the ordering of points in each of the files such that the first point in [CalibA] corresponds to the first coordinate in [CalibB] with both coordinates representing the world space coordinate appearing first in the [WorldPts] file. [PtsA] and [PtsB] must also contain an equal number of 2D coordinates which represent points corresponding accross 2 images usually obtained via as stereo matching algorithm. Once the application has been executed the file specified by [Output] will represent the 3D projection of the corresponding points specified in [PtsA] and [PtsB]. The source code for this project is written in C++ and requires installation of the OpenCV library. No project files are include however it is trivial to create a solution in the IDE of your choice. SopcastSports is a Tcl/Tk GUI for the linux version of sopcast tailored towards watching live sporting events. SopcastSports strips live game information from the web (www.myp2p.eu) and presents a list of sopcast streams, sorted by game, to the user. SopcastSports allows the viewing of multiple simultaneous streams and provides greater information regarding the status of the stream than other sopcast clients. If you use sopcast primarily for watching sporting events or simply dislike using sopcast on the command line then this application may be of use to you. Feel free to modify the code and redistribute as you see fit, however, please share any updates to the code you make with the community. I wrote SopcastSports in a couple of afternoons so it’s far from perfect – if you find and fix any bugs or code any improvements I would love to hear from you. All these applications are available from the Synaptic Package Manager or equivalent with the exception of the SopcastSports files which can be downloaded via the link above. This Google summer of code project provides another c++ framework for evaluating stereo correlation algorithms and also a useful template library to ease OpenCV programming. The goal of this project is to provide a library of efficient 3D computer vision routines for image and video processing. It includes routines for dense stereo matching, optical flow (motion) estimation, occlusion detection, and egomotion (3D self-motion) estimation. Provides symmetric dense stereo matching with occlusions, symmetric dense optical flow with occlusions, probabilistic 3D egomotion estimation. Designed as a template library. Uses adapters to be compatible with Matlab, OpenCV, and can be easily tailored to be used with any other image processing library. Example code is included for OpenCV and Matlab. Modular structure of Stereo and Optical flow code makes it easy to add new algorithms for local matching, global matching, pre- and post-processing. You can visit the project homepage and download source code here. I recently implemented a simple historgram backprojection based vision controller. 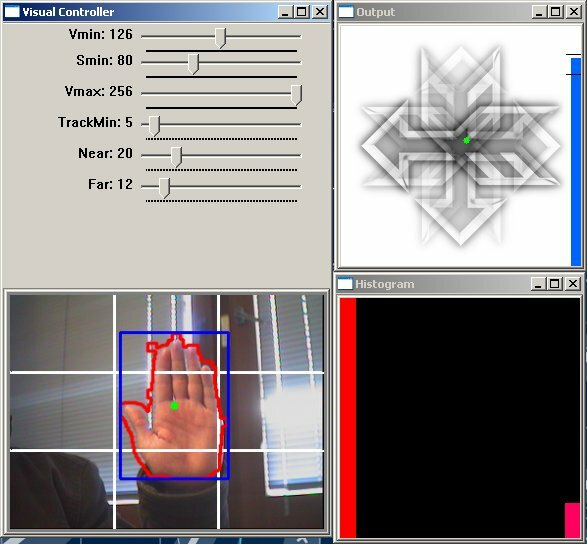 The sample video (below) shows a hand being tracked with the position of the hand influencing the output of the controller. Distance from the camera is calculated using the area of the object being tracked. Feel free to download the source code with compiled windows binaries. A working OpenCV installation is also required for this demo to function. Visual Studio 6 project files included. Feel free to mail me with any comments you may have. You are currently browsing the archives for the Source Code category.